Turf padding is placed under your artificial lawn to absorb shock. It keeps the ground soft and safe. You can use it instead of infill. There are a lot of reasons why you might want to do so. Infill can be made up of soft grains or small clumps of rubber. It looks and feels a bit like sand. Turf padding is made of foam and comes in sheets. These sheets are sort of like a mattress under your lawn, and they can absorb a lot of shock on impact. Pads will not move, but infill can shift over time. Heavy foot traffic or play can move the infill because it can pile up or wear down where there is a stress point. Most lawns won’t see enough stress for the infill to shift. However, a high-impact zone like a sports field will see so much foot traffic that infill may move as athletes run, jump, and fall hard on the ground. This may cause infill to be uneven and a few years down the road it will be less safe. Wear like this can lead to hard spots in a sports field or play area which is bad news as far as safety goes. That’s not the only way in which pads can beat infill for play zones. Some types of infill are made with crumb rubber, which may prove to be a health hazard. You may have read about this hot topic in the news. Turf pads have no crumb rubber. Those are just two of the reasons why pads are set to beat infill as the best choice for sports field and play area use at home and in commercial yards. Some types of infill are made with crumb rubber, which may prove to be a health hazard. You may have read about this hot topic in the news. Turf pads have no crumb rubber. Those are just two of the reasons why pads are set to beat infill as the best choice for sports field and play area use at home and in commercial yards. Watersavers Turf has a variety of padding including heavy duty foam shock pads, ideal for high energy play areas like sports fields and school playgrounds. Sports field turf pros know that lawn pads are key to player health, and the rules for pro level turf must take care of the folks who will play on it. One more new trend in safe sports fields is a pledge to say goodbye to the crumb rubber infills that have been the cause of some controversy in the news. Many types of infill are made with crumb rubber that is recycled from road tires. The EPA, the CDC, and the CPSC have joined forces on an action plan to start a study in 2016 about the health risks of crumb rubber. There have been questions about its long-term use. Crumb rubber may prove to cause harm over time, and could even raise the risk of cancer. That’s one of the health issues that the task force will look at, and the jury is still out on what they will find. Shock pads are not made with the same controversial crumb, which means they are a great choice for sports fields, where there is no room to take risks with players’ health. The new class of shock pads is as safe as it gets. Their low G-max is just one reason why heavy duty pads are set to beat infill as the top choice for pro and amateur sports fields. Above all else, sports field turf needs to be safe for play. When you plan a synthetic field, think about what will go under it. Only the best pads will do, since the turf will see a lot of heavy impact as players run, fall, jump, and tumble on the ground. In the past, there have been concerns about sports field turf not meeting the GMax Shock Testing requirements. This rating can tell you how safe is a pad or infill. A G-max score shows the risk of severe harm or traumatic brain injury on impact. The lower the score means the safer the pad. Right now, the U.S. Consumer Product Safety Commission asks for a G-max of 200. That’s not enough for turf industry leaders and the soccer pros at FIFA, who have a new set of rules that ask for turf shock pads to have less than a G-max rating of 165. Our turf products have been tested by TSI in Dalton, Georgia. 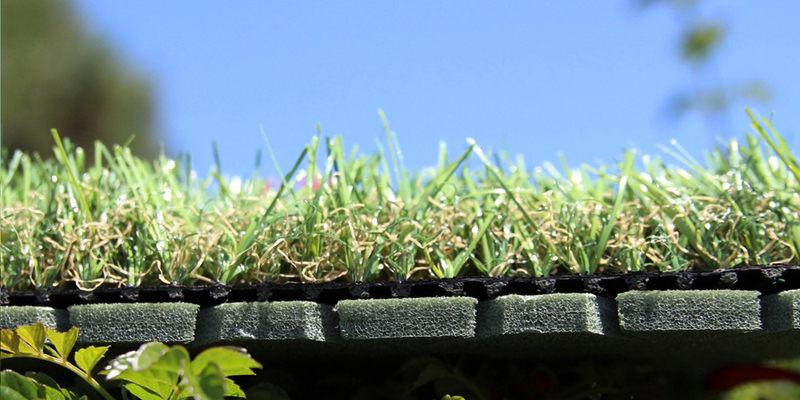 The safe fall height score makes fake grass a smart design choice. Turf that is soft to land on is great for all the lively young ones who like to run and jump, but often fall or have a stumble as they take part in active play. A better fall height score means that there is less chance of serious injury. That’s a good reason to install faux grass with the right lawn pads. Few areas see as much wear and tear as a place where kids play. Little feet move fast, and they move hard, but lawn padding stays in place no matter what. Because it comes in sheets, it won’t move like some infills. That is why turf pads are a good choice for a play area. That’s where kids are sure to put any fake lawn to a tough test with hard traffic. Contact Watersavers for your shock pads, lawn pads, or other turf padding needs. We also stock a full range of other artificial grass accessories for home and commercial use. You can get a free estimate online, chat with us online, drop by one of our stores, or call us at 844-974-8873.